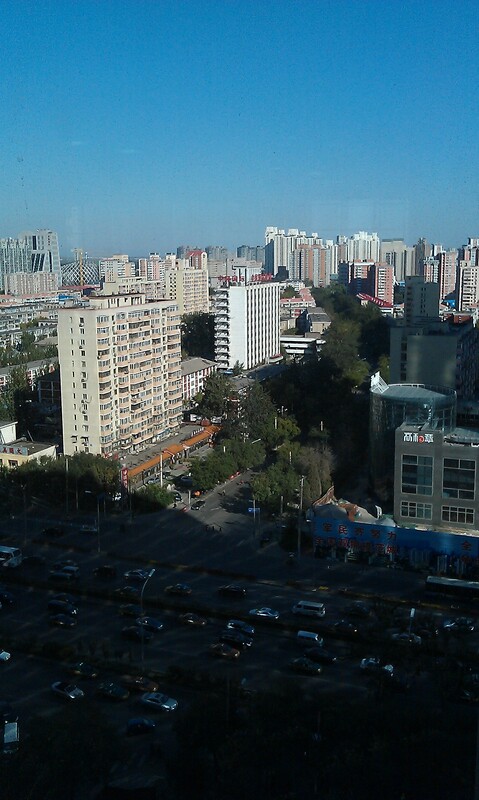 Here are a couple of photos I took when working in an office overlooking the eastern part of Beijing’s 3rd ring road (东三环). The first one was taken during a bad spell of pollution that occurred at the end of November and continued into December. Taken from the 16th floor of the Jiaming Centre on Dongsanhuan. The second photo was taken a few days later, after the pollution had cleared. On bad days the air in Beijing would be almost soupy and thick with a dusty, tangy smell. My clothes (and my cat’s fur) absorbed this distinctive Beijing scent. After two years in the capital I developed a sinus issues and spent my remaining two years snivelling into tissues. After being back home for a year, my nose is pretty much back to normal (not that London not is polluted either, but it’s considerably less polluted than Beijing). For a long time, the Chinese government insisted on referring to the pollution as fog and its Ministry of Environmental Protection gave out suspiciously low air-quality readings, whichwere somewhat conflicting with the alarmingly high readings released by the US embassy situated in downtown Beijing (very near to where I used to live). However, the discrepancies between the two sets of readings were thrust into the limelight following the handy China Air Pollution Index app that displays real time air quality readings from the US Embassy in Beijing and the Ministry of Environmental Protection. 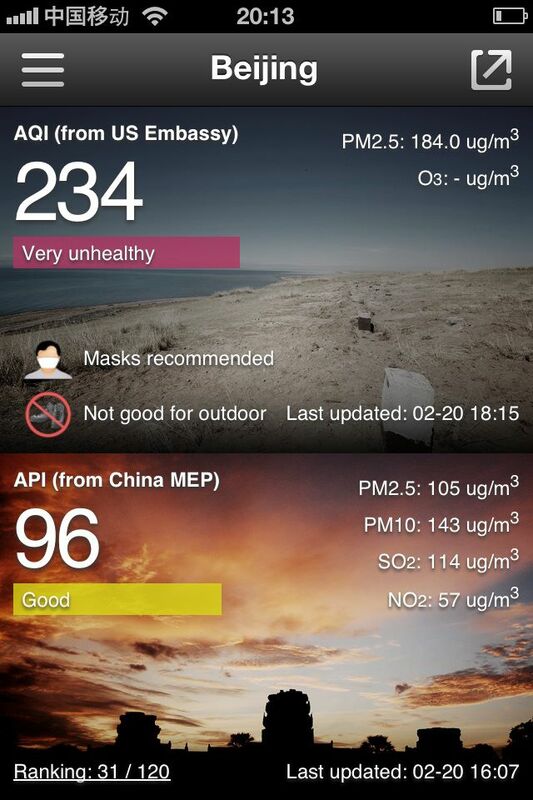 In February 2012, CNN’s Beijing-based Anchor, Steve Jiang, tweeted this screenshot from the China Air Pollution Index app. Source. Coincidentally, the Ministry of Environmental Protection started releasing more accurate air quality readings. More recently, the Chinese government has actually started referring to the suffocating grey haze that can cover the city for days as smog and the authorities have embarked on a wide range of strategies to improve air pollution in response to public outcry, but it will take time for improvements to show. 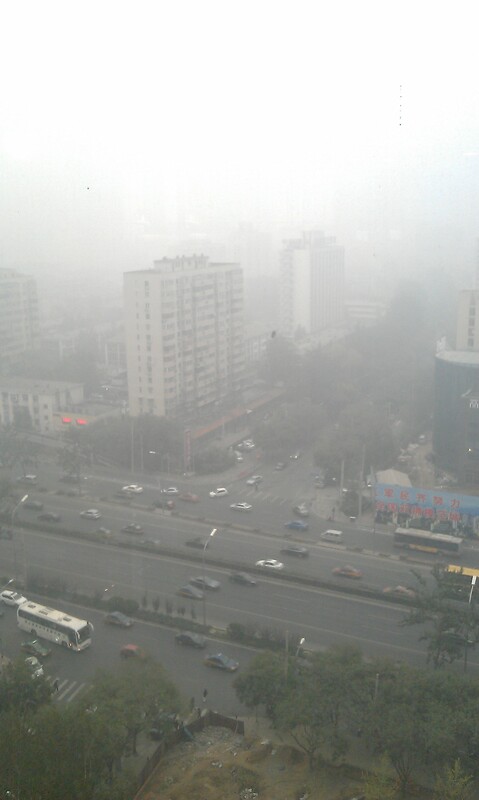 While there are oodles of things I miss about China, the pollution certainly isn’t one. Even when the pollution is more or less cleared the problem remains. The pollution is just washed away to the soil by the rain or pushed away by the wind, but sooner or later it will always come back whether in the air, the food or the water. We must push for major reforms or China will slowly be poisoned from North to South, East to West. Oh my goodness, those pictures are insane! I believe I’m going to be living in Beijing beginning later this year – having grown up on a farm, I think the air pollution is something that I’m really going to grow to dislike! Invest in a good face mask! Lots of people wear face masks in Beijing (although, they tend to just wear surgical masks or ones made from a bit of fabric, which are pretty ineffective at filtering the air). The pollution is worse in the winter months. In the warmer months it’s less bad and you can escape to the mountains surrounding the city too. What will you be doing in Beijing? My boyfriend has been accepted into a university there, starting in September – I’m planning to go with him, after I graduate in November. Not completely sure, but I am thinking of teaching English so that I can stay on a working visa… Do you think that would be plausible? I should think so, there’s plenty of opportunities for native English speakers to teach English. It’s definitely fun to do for a year or two. If you are employed full time by a school, you will be provided with a legal working visa. If you can do a TEFL course before you go or get some kind of cert, it might help with your employabilty. Some schools also pay more if you have a TEFL cert. If you can, try to arrange as much as you can before you arrive, rather than relying on finding a job when you get there. But yes, it’s definitely a plausible idea. You’ll certainly have lots of fun! Yes, I’ve had a look at some TEFL courses and think I’ll probably do one before I start working – I think I’d want to understand the English grammar etc a bit more before teaching anyway! I’m planning to go on a tourist visa for a month in September first, as I have 5 weeks holiday, so hopefully I can get a feel for it a bit then. Do you think it’d be easier to find a school online or while I’m there? Shall I send you an email? Something I recall from South Korea is their ominous Mid-Spring pollution storm that comes over from Mainland China and settles in Seoul. Apparently the South Korean government donated vast numbers of trees to China to help create a natural barrier, and the Chinese government planted them for gentrification purposes instead, saying “Eh, they were a gift, we do what we want with gifts”. It was a bit of a wasted effort, in the end. My friend is living in Beijing now and she sent me similar shots of “before” and “after”. It is incredible to think that so many people huff that in and out each breath. Glad to be in Singapore! Yeah… I certainly don’t miss it!